Leather with darkened edges. Complete with matching reins and curb bit. Double cheek adjustment. Russet, brown, black. Doubled and stitched skirting leather, 5/8" at cheeks. Double ply reins over 6 ft. long. Top quality leather. Russet, burgandy or black. Doubled and stitched skirting leather, 5/8" width. Double ply reins over 6 ft. long. Top quality leather. Russet, burgandy or black. Heavy duty doubled and stitched breaking bridle, 1" width skirting leather. Double ply reins over 6 ft. long. Top quality leather. Russet, burgandy or black. 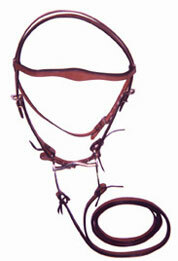 A finely styled bridle made of standard quality leather. 1/2" x 5/8". Plain reins. Less bit. A finely styled plain snaffled bridle with caverson. Standard quality leather. 5/8" laced rein. Less bit. Walnut brown.